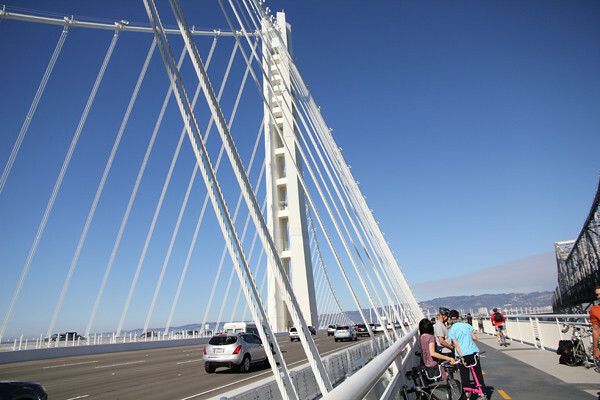 This past weekend we went to Oakland and biked up on the new East Span of the Bay Bridge. 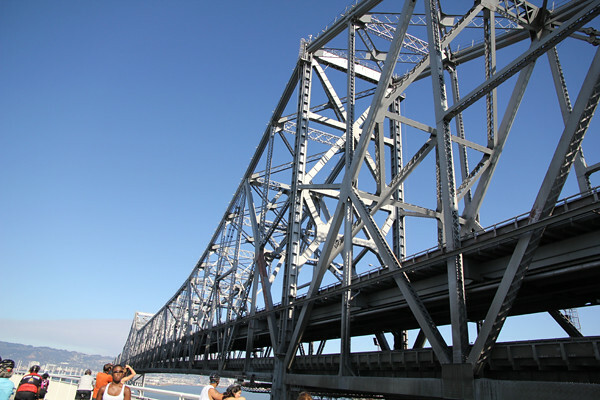 The East Span started construction in 2002 at a final cost of $6.4 billions and it was recently opened on Labor Day. It was built to replace the old bridge due to earthquake safety hazard. It is truly a bridge with a bike path built from the start. Golden Gate Bridge’s bike path was originally built for infantry to cross it during WWII. 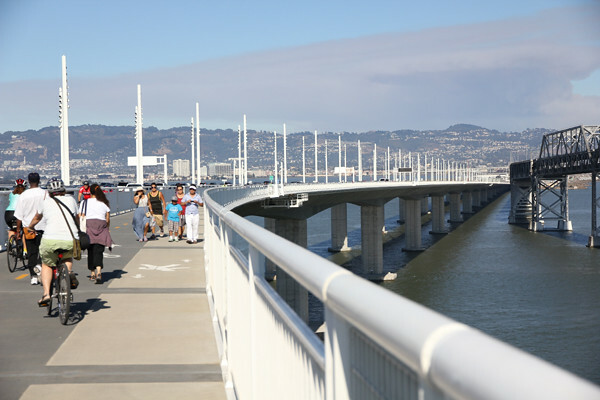 It’s 3.4 miles (5.5 km) bike ride from the entry point (Oakland’s Maritime St.) to near the end of the bridge. There’s another entry point on Shellmound St. in Emeryville. The actual length of the bridge is 2.2 miles (3.5 km) and sits lower than the old industrial bridge with a 2% incline (an easy climb for both biking and walking). 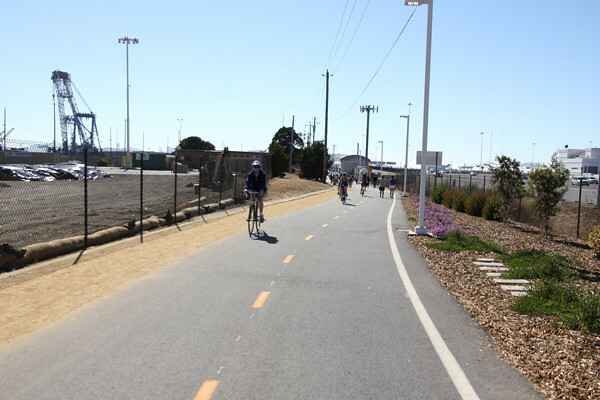 The bike path has a speed limit of 15 mph (24 km/h) and both bike/ped path is 15.5 ft (4.7 m) wide. Unfortunately, I think the pedestrian path is narrow causing many pedestrians to spill over onto the bike path. Still, it was a lot of fun and the location is not as windy and noisy as the Golden Gate Bridge. Indeed, this is definitely going to be a tourist trap but I hope it doesn’t get as crowded as Golden Gate Bridge though. The bike path does not open all the way to Yerba Buena Island yet because there’s a section of the old bridge that is blocking the bike path. 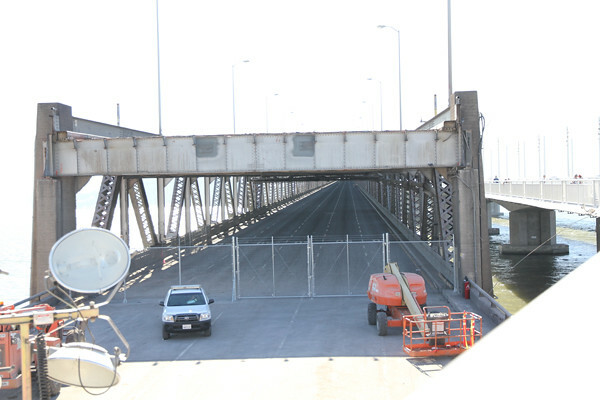 The entire bike path will be completed by 2015 when the old bridge is dismantled. When it does, it will make a great recreational ride. 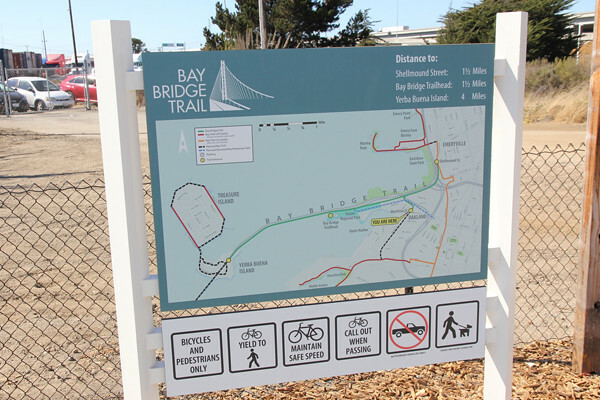 Just picture yourself riding from Oakland or Emeryville, across the gorgeous Bridge, through a natural island called Yerba Buena Island and end in Treasure Island for lunch. It could be a nice 30 miles/48 km round trip depending on where you begin. This sign was located on Maritime St. entry point in Oakland. When I saw this, I really want to bike inside. It’s too bad it’s going to get demolished. Notice pedestrians are walking on the bike path. I hope this gets straighten out in the future. Farewell old Bridge! Thanks for the wonderful 77 years.